The Weston® 7 lb Vertical Sausage Stuffer is a heavy duty stuffer for canners wanting to can homemade sausage made to their own specifications. Boasting a 7 lb. stainless steel canister, the Weston sausage stuffer is made for heavy usage. 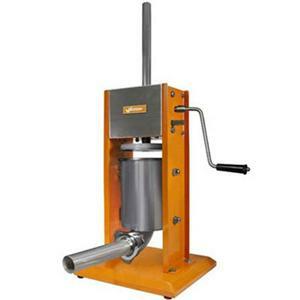 The sauage maker's dual speed, heavy duty steel gears allow for fast plunger reversal and quick refilling.